The Mystery of a Hansom Cab is a mystery fiction novel by Australian writer Fergus Hume. The book was first published in Australia, in 1886. Set in Melbourne, the story focuses on the investigation of a homicide involving a body discovered in a hansom cab, as well as an exploration into the social class divide in the city. The book was successful in Australia, selling 100,000 copies in the first two print runs. It was then published in Britain and the United States, and went on to sell over 500,000 copies worldwide, outselling the first of Arthur Conan Doyle's Sherlock Holmes novels, A Study in Scarlet (1887). 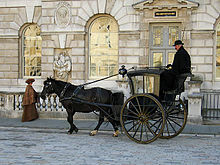 Reception of The Mystery of a Hansom Cab was positive; it received praise in works including A Companion to Crime Fiction, A History of the Book in Australia 1891–1945, and A History of Victoria, and was featured in the book Vintage Mystery and Detective Stories. A parody version was published in 1888, and film adaptations were produced in 1911, 1915, and 1925. The story was adapted into a BBC Radio serial in 1958, a stage play in 1990, a radio promotion in 1991, and a telemovie in 2012. Originally from Britain, Fergusson Wright Hume worked as a barrister's clerk in Melbourne, Australia, at the time of the book's first publication. Hume went on to become a prolific author, and wrote more than 130 novels in fiction subjects including adventure and science fiction. The Mystery of a Hansom Cab takes place in Melbourne, Australia, and involves an investigation into a homicide, after a corpse is discovered in the evening, in a hansom cab. Melbourne plays a significant role in the plot and, as the author describes: "Over all the great city hung a cloud of smoke like a pall." The killer's identity is not as significant a revelation in the story as are the roles of the influential and secretive Frettlby family, and their secret: they have an illegitimate daughter living on the streets. The class divide between Melbourne's wealthy and less fortunate is addressed throughout the plot. The protagonist in the novel is a policeman named Detective Gorby, who is given the task of solving the murder. As Hume describes the character's investigative skills: "He looked keenly round the room, and his estimate of the dead man's character was formed at once." The author commented in a later introduction, "All of the scenes in the book, especially the slums, are described from personal observation; and I passed a great many nights in Little Bourke Street, gathering material". At this time, the street had gained notoriety as a place frequented by prostitutes and criminals. The Mystery of a Hansom Cab was first published in Melbourne in 1886, in Britain in 1887, The author self-published the first edition of the novel. and in the United States in 1888, by G. Munro. Hume wrote an introduction to a revised edition published in 1898, and later publications have included those by New York City publishers Arno Press, in 1976, by Dover, in 1982, and a new Australian edition with an introduction by Simon Caterson, in 1999 by The Text Publishing Company, which has been reprinted several times. A Concise History of Australia notes that the book became an "international bestseller". A Companion to Australian Literature since 1900 noted The Mystery of a Hansom Cab "provided Australia with its first international bestseller". and Vintage Mystery and Detective Stories characterized the book as "the best-selling detective novel of the nineteenth century". In Australia, the book sold 25,000 copies in its first print run, and 100,000 copies in its first two print runs. In Britain, in its first six months after publication, 300,000 copies were sold, and in 1888, sales continued in thousands in Britain each week. According to A Gregarious Culture (2001), "sales of The Mystery of a Hansom Cab, published in 1886, would reach astronomical figures". Over 500,000 copies were sold in Britain, by the publishing company Jarrod. In the United States, an additional 500,000 copies sold. The author did not benefit greatly from the sales of the work, as he had sold his rights to the book for GB£50. A Gregarious Culture identifies "the only known copy of the first edition" of the book as "a treasure" of the Mitchell Library at State Library of New South Wales. Illustrated London News reported in 1888 on the popularity of the book: "Persons were found everywhere eagerly devouring the realistic sensational tale of Melbourne social life. Whether travelling by road, rail or river the unpretending little volume was ever present in some companion's or stranger's hands." The book outsold the worldwide 1887 publication of the Sherlock Holmes novel A Study in Scarlet by Arthur Conan Doyle. "The most spectacular reimagining of the sensation novel"
Charles J. Rzepka and Lee Horsley's A Companion to Crime Fiction (2010) called The Mystery of a Hansom Cab "The most spectacular reimagining of the sensation novel, and a crucial point in the genre's transformation into detective fiction". A History of the Book in Australia 1891–1945 (2001) described the book as "a lively and engaging crime novel which used its Melbourne setting to considerable effect." Geoffrey Blainey wrote in A History of Victoria: The Mystery of a Hansom Cab "did more than any book to give the outside world a picture of Melbourne of the late 1880s". David Stuart Davies featured the work in his book Vintage Mystery and Detective Stories, writing, "The author was determined to make a fortune by creating a story 'containing a mystery, a murder, and a description of low life in Melbourne'. He succeeded. Like a rich plum in our vintage mystery pudding we include the whole novel in this collection." A parody edition, titled The Mystery of a Wheelbarrow (1888), is attributed to a W. Humer Ferguson. The same year, it was adapted for the stage by Arthur Law. The Mystery of a Hansom Cab (1911) is a film produced by Amalgamated Pictures, an Australian adaptation of the book. In 1915, the book was again adapted into a film with a screenplay by Eliot Stannard. Directed by Harold Weston, the film starred actors Milton Rosmer, Fay Temple, A.V. Bramble, James Dale, and Arthur Walcott. A remake of the 1911 version of the film was produced in 1925, in Australia. The 1925 cast included Arthur Shirley, Grace Glover, Godfrey Cass, Cora Warner, and Isa Crossley. The Mystery of a Hansom Cab title of 1935 was a reissue of the 1925 Australian silent film. It was released by Pathescope. A six-part radio serial adaptation was broadcast on the BBC Light Programme from 2 November to 7 December 1958. The Mystery of a Hansom Cab (1958). Melbourne television station GTV-9 produced a version of the play in 1962, adapted by Barry Pree, as part of The General Motors Hour. Michael Rodger adapted the story as a stage play in 1990 and a radio promotion in 1991 by Queensland Performing Arts Trust. Burberry Entertainment, in association with the Australian Broadcasting Corporation, produced a telemovie adaptation which premiered on 28 October 2012 and stars John Waters, Oliver Ackland, Helen Morse, and Jessica De Gouw. ^ a b c d Birns, Nicholas; Rebecca McNeer (2007). A Companion to Australian Literature since 1900. Camden House. pp. 391–393. ISBN 1-57113-349-6. ^ a b c d e f g h i j k Rzepka, Charles J.; Lee Horsley (2010). A Companion to Crime Fiction. Wiley-Blackwell. pp. 107–109. ISBN 1-4051-6765-3. ^ a b c d Lyons, Martyn; John Arnold (2001). A History of the Book in Australia 1891–1945: A National Culture in a Colonised Market. University of Queensland Press. pp. 241–243. ISBN 0-7022-3234-3. ^ a b Blainey, Geoffrey (2007). A History of Victoria. Cambridge University Press. p. 72. ISBN 0-521-86977-3. ^ a b c d e f Davies, David Stuart (2006). Vintage Mystery and Detective Stories. Wordsworth Editions Ltd. pp. 15–17, 1059, 1063. ISBN 1-84022-065-1. ^ a b c d Jill Roe; Margaret Bettison (2001). A Gregarious Culture: Topical Writings of Miles Franklin. University of Queensland Press. pp. 227–230. ISBN 0-7022-3237-8. ^ a b c Young, R. G. (2010). The Encyclopedia of Fantastic Film. Applause Books. p. 434. ISBN 1-55783-269-2. ^ a b c d Reade, Eric (1979). History and Heartburn: The Saga of Australian Film, 1896–1978. Harper & Row. p. 44. ISBN 0-8386-3082-0. ^ The Mystery of a Hansom Cab. Australian Broadcasting Commission. ^ a b Macintyre, Stuart (2009). A Concise History of Australia. Cambridge University Press. pp. 111–113. ISBN 0-521-51608-0. ^ a b c d Parrinder, Patrick; Andrzej Gasiorek (2011). The Oxford History of the Novel in English: Volume 4: The Reinvention of the British and Irish Novel 1880–1940. Oxford University Press, USA. pp. 213–216. ISBN 0-19-955933-3. ^ a b c d e Pierce, Peter (2009). The Cambridge History of Australian Literature. Cambridge University Press. pp. 114, 274. ISBN 978-0-521-88165-4. ^ Brown-May, Andrew (1998). Melbourne street life: the itinerary of our days. Australian Scholarly/Arcadia and Museum Victoria. p. 28. ISBN 978-1-875606-46-7. ^ The Mystery of a Hansom Cab. The Text Publishing Company. ^ Plarr, Victor (1899). "Law, William Arthur". Men and Women of the Time: A Dictionary of Contemporaries (15th ed.). G. Routledge. p. 626. OCLC 457880067. ^ "PICTURE PROFILES IN THE OLDEN DAYS". Winner (Melbourne, Vic. : 1914 - 1917). Melbourne, Vic. : National Library of Australia. 9 February 1916. p. 11. Retrieved 19 June 2015. ^ The Mystery of a Hansom Cab. Archive.org. 1936. ^ "Author, 23, In Rare Double". The Age. 17 August 1961. p. 12. ^ "Premiere – Mystery of a Hansom Cab". ABC. Retrieved 26 October 2012. ^ "The Mystery of a Hansom Cab". Museum Victoria. Retrieved 26 October 2012. "Australian Classics: Fergus Hume's Mystery of a Hansom Cab". The Book Show. Radio National. 29 December 2009. Binyon, T.J. (1989). Murder Will Out: The Detective in Fiction. Oxford. pp. 70–71. ISBN 0-19-219223-X. "Fergus Hume". Dictionary of Australian Biography. Kirk, Pauline M. (1972). "Hume, Fergusson Wright (Fergus) (1859–1932)". Australian Dictionary of Biography, Volume 4. Melbourne University Press. pp. 443–444. Pittard, Christopher (2008). "The Real Sensation of 1887: Fergus Hume and The Mystery of a Hansom Cab". Clues: A Journal of Detection. 26 (1): 37–48. Sussex, Lucy (2015). Blockbuster! Fergus Hume and The Mystery of a Hansom Cab. Text Publishing. ISBN 9781922147943. Wands, D.C. "Fergus Hume". Fantastic Fiction. Retrieved 6 November 2009. Wikimedia Commons has media related to Fergus Hume. "Fergus Hume bibliography". Classic Crime Fiction.